One of the most popular after-work activities in the Soviet Union was partying in discotheques. Today, DJs are everywhere in Russia. Nine out of 10 public festivities will include a DJ at some point. A disc jockey's equipment nowadays consists of a laptop, a compact mixer and a pair of headphones — and they all easily fit into a backpack. DJs come to you wherever you need them now, but there was a time when people stood in long lines looking for tickets to the magical place called the discotheque. Looking back on how people in the Soviet Union spent their time after work, the first thing that comes to mind is the discotheque: The 1980s were truly the golden age of Soviet discos. It is well known now that, in the Soviet Union, people led a hard, monotonous and uneventful lifestyle. Yet, regardless how difficult life was for Soviet citizens, they liked to have fun—so they found a natural and safe way to entertain themselves by organizing dancing parties. Even during Stalin’s hard-line dictatorship, people were able to dance in official culture clubs in the cities, or in the "dvor" (courtyard) in front of their homes. The older generation still remembers summer evenings when someone would bring their “patephone” (gramophone) in front of the building and neighbors would come down to dance "Rio Rita"—a popular tune at the time. The sources of music at dancing parties were usually the mechanical turntable, an accordionist, or a simple, three-piece band. Dancing in the Soviet Union was probably one of a few officially permitted types of entertainment. Many Soviet films in the 1930s–1950s included dancing scenes, and these films were ideologically approved by Soviet censors. In the 1970s, the worldwide disco fever reached the homes of Soviet citizens. The first discotheques in the Soviet Union started in the Baltic republic, which are now independent states and members of the European Union. Western types of discotheques were very welcome among Soviet citizens, because such discos gave them a new and modern way to arrange the dancing parties they loved so much. In a typical Soviet organization, where people went to work from 9 a.m. to 5 p.m., staff meetings were mandatory at least once a month. Such meetings were full of ideological speeches and so-called political information presented by local leaders of the Communist Party. Events of this kind were arranged in culture clubs or at auditoriums, where a few hundred people could be seated. To make such events more attractive to people, local Communist Party operatives and their younger followers from the Komsomol (Soviet communist youth organization) tried to put some kind of entertainment at the end of the stiff and boring ideological event — and the discotheque was the perfect solution. This means that the disco was an entertainment tool controlled by a Communist Party’s culture department. Since most of the disco attendees were from a younger Soviet generation, its management was put in the hands of Komsomol. Discotheques in the Soviet Union came in all types of forms. For example, the most desirable and fancy discos were opened in the bars of the Intourist hotel chain, which had nice equipment and a comfortable environment. Average Soviet citizens had no access to these types of hotels and bars. Only Soviet and Komsomol nomenclature could get in to mingle among foreign tourists, local hookers and an army of KGB undercover agents. In addition, black-market dealers and profiteers were regular visitors at Intourist hotels bars, and discos because the place that offered a natural environment for their transactions. The first professional DJs started appearing in these upscale places. Since a Western-style entertainment industry was absent in the Soviet Union, Soviet professional DJs were trained in the typical anti-capitalist's style. "Let's take our great friendship with of our dearest friends from Socialist countries to the next level!" "Let’s dance to keep our bodies fit and healthy!" "Discoteque dedicated to International Women’s Day"
"Let's celebrate the wedding of our dearest comrades Ivanov and Petrova!" DJs needed be very creative to obtain an official approval for their music sets. Since music was a part of Soviet ideology, there were censors who decided which music could be performed and which could not be allowed. Moscow's Summer Olympic Games in 1980 were a major boost for discotheques in the Soviet capital. New sporting arenas and hotels were built with entertainment and recreational facilities. When the Olympics were over and thousands of foreign tourists left Moscow, new state-of-art discotheques became very desirable places for the Soviet youth. One of those brand-new discotheques was inside a bicycle stadium, "Velotrek," in Moscow’s Krylatskoye neighborhood. This discotheque was supervised and managed by Kuntsevo District Komsomol Headquarters. However, even though this discotheque was controlled by a Komsomol, a certain kind of freedom was allowed and even underground bands began playing there, much to the enjoyment of the trendy crowd, full of students. This is an old Soviet tradition: If some kind of trend starts in Moscow, it will spread all over the country in a few years. The same thing happened with discos. Various discotheques were open in student dormitories, workers’ culture clubs, street cafes and restaurants. In these places, censorship was nominal and people were able to play any type of music they wanted. It is interesting that, in the Soviet Union, most popular music tunes were not the same as in the West. For example, in the early 1980s, the most popular Western tune in the Soviet discotheques was "Abracadabra" by the Steve Miller Band. This song was everywhere. Also, there were popular tunes from Boney M, Dschinghis Khan, Modern Talking. Some Soviet DJs, such as Sergei Minayev, tried to imitate popular Western disco tunes by creating Russian versions of it accompanied by a stage performance. Soviet people very much enjoyed Italian pop singers such as Celentano, Pupo, Al Bano and Romina Power and, of course, "Estrada" music style based on hits from Soviet pop stars . As a result, a typical Soviet disco night included music from the U.S., England, Germany, Italy, France, Sweden and the Soviet Union. It is very unusual and it may seem strange, but this is how it was, and music tastes among the general Russian public has not changed much since the 1980s. The discotheques were also a place for black-market commerce. Tickets for discos were often counterfeited. Bartenders were selling crooked cocktails with cheap alcohol. Dealers were selling Western clothes and jeans under the table. Discotheques became hotspots for alternative culture and commerce. During student discotheques DJs, tried to play more meaningful music and bring some kind of music education to the masses. They played Pink Floyd, King Crimson and Yes. Sometimes, for example, the DJ introduced a speaker who would hold some kind of lecture on Western rock. Because of a lack of technical equipment for discotheques and other shortages in the Soviet Union, DJs used a pair of reel-to-reel recorders as their main tool. The use of turntables was problematic, because one vinyl LP from Western music stars cost almost an entire month’s salary on the black market. No one wanted to chance damaging or losing these precious LPs during a DJ performance. Typically, two reel-to-reel recorders for a DJ set included a prepared music reel for the night on one recorder and a reel for requests from the audience, which was a typical feature of Soviet discotheques, as well the "white dance" — a slow number where women invited men to dance. 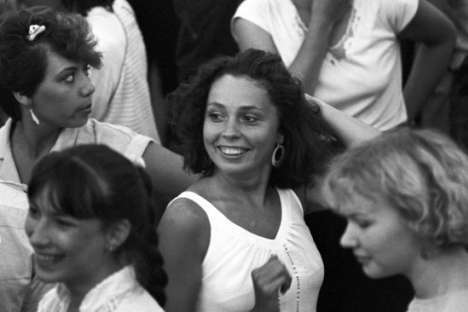 Requests for tunes and "white dances" were inherited from traditional dance parties in the Soviet Union, prior to the disco craze. Members of the Soviet generation from the 1980s, now in their 50s, are still active and looking to remember the good old days from time to time. In many Russian cities, parties commonly themed as "discotheque from the 1980s" are frequently organized. In Moscow, a 1980s discotheque annually takes place at the Olympic stadium, where thousands of people sing along and dance to their favorite tunes and acts from that decade. Vasily Shumov is a musician, producer, and photo and video artist. Born in Moscow, he founded Moscow’s first new wave and electronic band, Center (Центр), in 1980. From 1990 to 2008, Shumov lived in Los Angeles, California, where he eventually graduated from the California Institute of the Arts with a Master of Fine Arts degree in 1998. Vasily has shown numerous solo and group exhibitions of his photo and video artwork. His recent personal photo art exhibition was held in April 2013, at the Central House of Artists in Moscow. In June 2013, he performed with his band Center at PAX Festival in Helsinki, Finland.